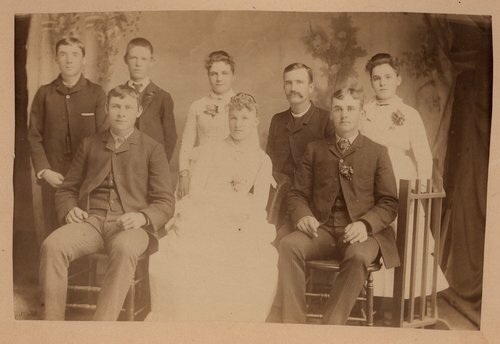 This photograph shows high school graduates in Waterville, Kansas. Students are identified: front row (left to right) Ross Burke, Anna M. Moden, Bertie Cowgill and Mamie Berry. Anna M. Moden was valedictorian speaker of the class. She was born July, 1869, in Waterville, Kansas, and her parents were Daniel and Maja Moden. A brief history of the Moden family is on the back of the photograph.